Kids' Knitting Workshop in Action! Click here for more information about Kids' Knitting Workshop! I had the sweetest email with some great photos arrive in my inbox. I had to share it with you, with permission, of course. The sender of the email, Liz, has received permission from the parents of the kids to share the photos here on my blog. 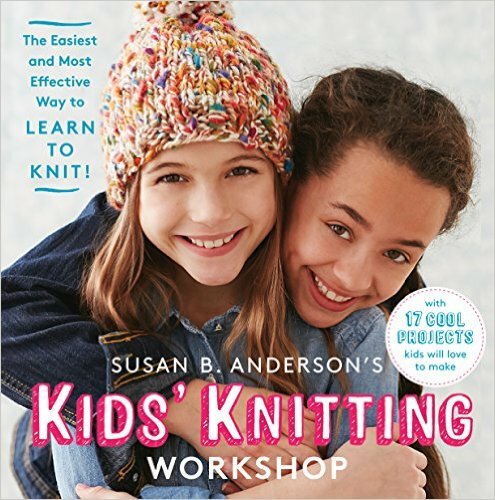 Anyway, I will let Liz tell you her story with knitting and kids and using my book, Kids' Knitting Workshop as a guide. Here's Liz! 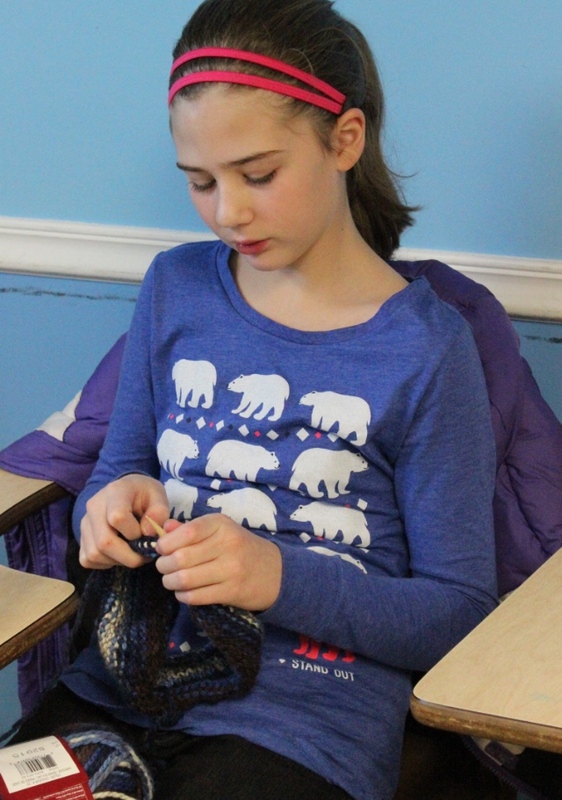 "I wrote you last week about using your new book to teach knitting to our home school, 9-11 years old, at our co-op. Our co-op meets on Thursdays for a day of classes for tots-high school. 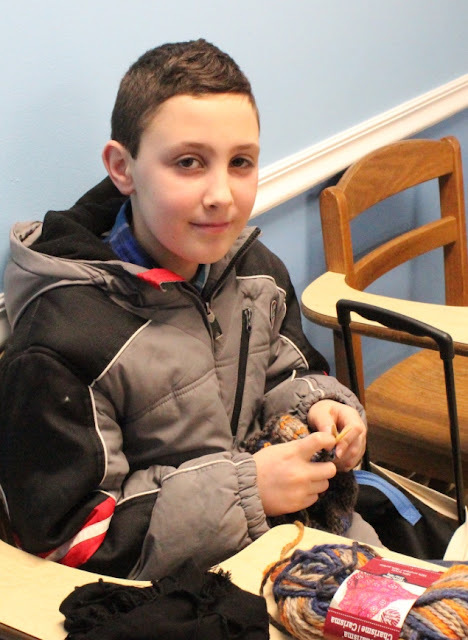 The first semester knitting class didn't go as well, but my son gave me your new book (star for him!!) for Christmas and I knew right away it would be great to use. The kids have really taken off! I started with 12 sets of circulars and cast on for the little hats. Along with that, I knit a row or two to get them going. Success! At lunchtime, I barely have time to eat anymore, as I have knitters bringing me their projects to look at, help with, or share smiles over. I've given them my text number, and have received many videos and photos with questions via the phone. We talk it out and review the photos then knit some more. By Thursday, they always have something great to show me. I have a wonderful assistant, Coleen, who has learned to knit also and we recruited another gal when we found out she could knit. I did get permission from all the parents to give you the photos and you may use them. Oh my--the kids would be so excited!! As I tell them every week- Knit on!! It's me again. I just love the look of pride in the faces of the kids in the photos. It's so exciting to see the book in action. Thank you, Liz, for sharing this experience with me. I love your success story! You are an inspiration, Liz. All of the photos of the kids have been provided by Liz Deluhery. I love the photo above so much. 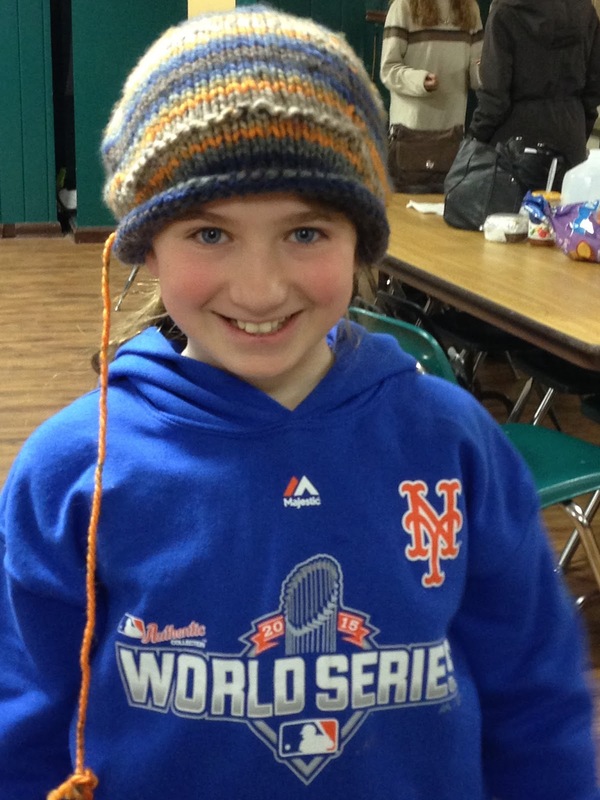 What great colors in the yarn for the hat. A little untangling going on there maybe? 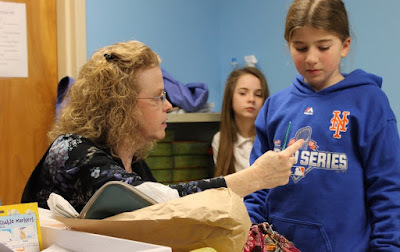 It takes patience to teach knitting for sure. You can feel the focus. 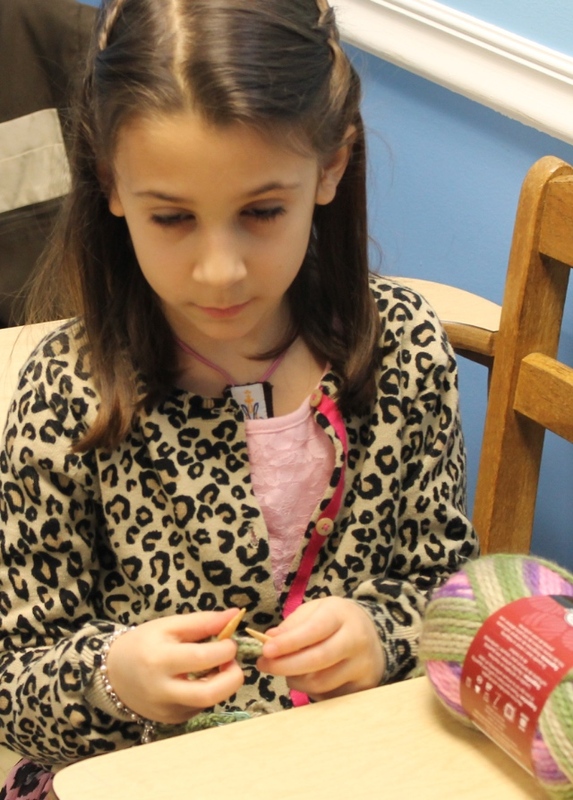 I love to see those little fingers working the yarn and needles. Wonderful! Such pride! It looks fantastic. It's so good to see generations working together to pass on the knitting. Finished with a pom-pom on top! It's perfection. The knitting even continues on after the class, the perfect end to a busy day. Liz, you made my day. 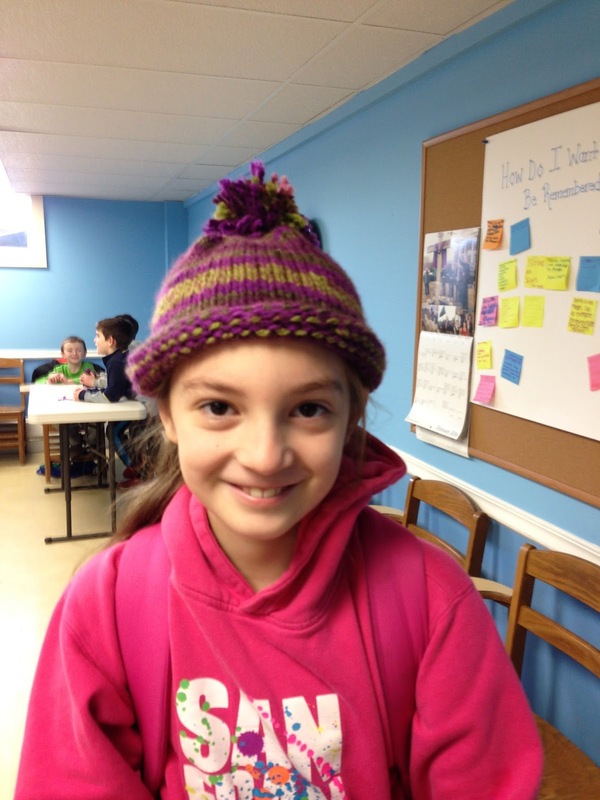 Please say hi to the kids from me and tell them how proud I am of their knitting. If anyone else has a success story, please let me know about it. 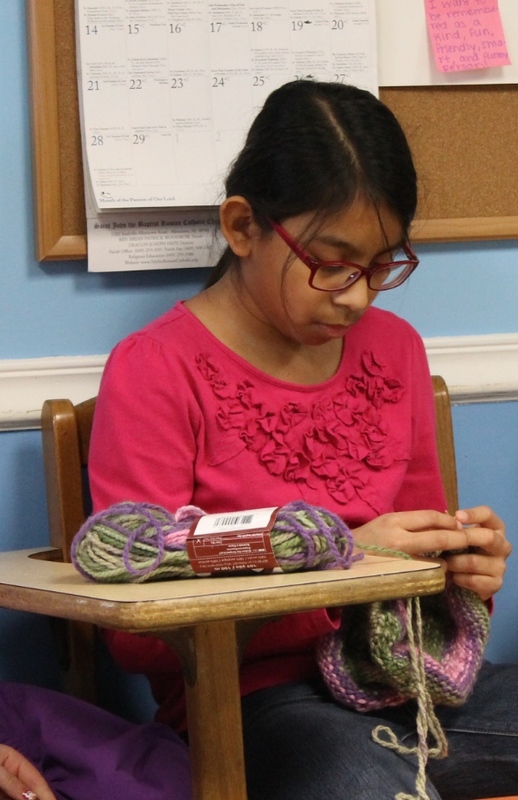 I'd love to hear about how people are using Kids' Knitting Workshop out in the world. Also, if you are on Instagram please use #kidsknittingworkshop so we can all see the projects and fun you are having with kids and knitting and the book. I'll be back soon with more. I hope you are all having a great week. Two More for the Drawer! Thanks to TC for modeling! I hope you are all doing well. I first want to quickly thank Greg of the Knitting Daddy blog (click here) for the book review. Greg has a great and informative blog and podcast so be sure to check it out! I have just finished up a couple of pairs of socks that have been in the works for a long time. I have shared photos of the finished socks on Instagram but I want to be sure to share the details here on the blog as well. The first finished pair has been in the works for a couple of years. I finished the first sock quickly and I started the second sock right away but I became distracted and let it sit. 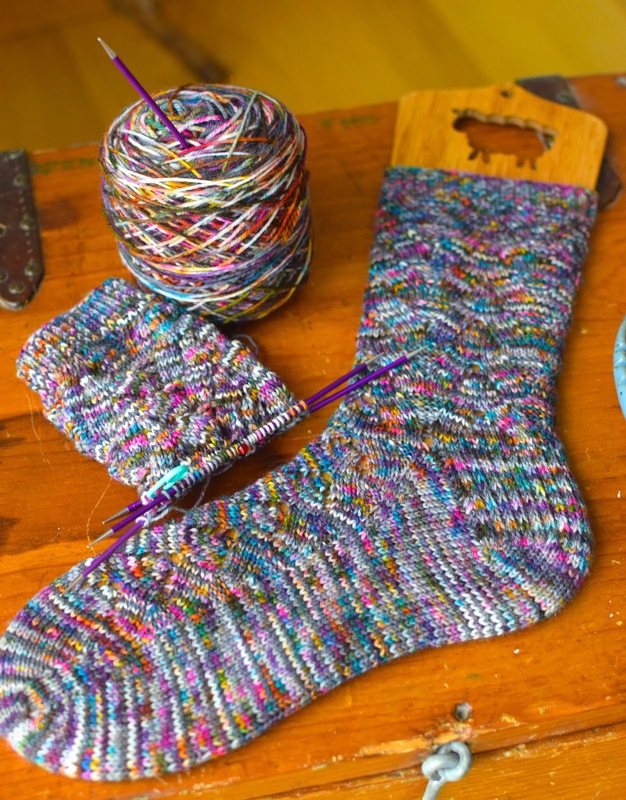 Recently Paula of the Knitting Pipeline talked about knitting socks in the same yarn and it reminded me that I needed to finish my socks, too. I'm so glad they are done. I love them and I love the yarn! For my sock I did 10 rounds of the twisted rib. 6 repeats of the chart for the leg. I used the heel and toe instructions from my free pattern, How I Make My Socks. For the foot, I did 6 repeats of the chart on the instep and stockinette on the bottom of the foot. 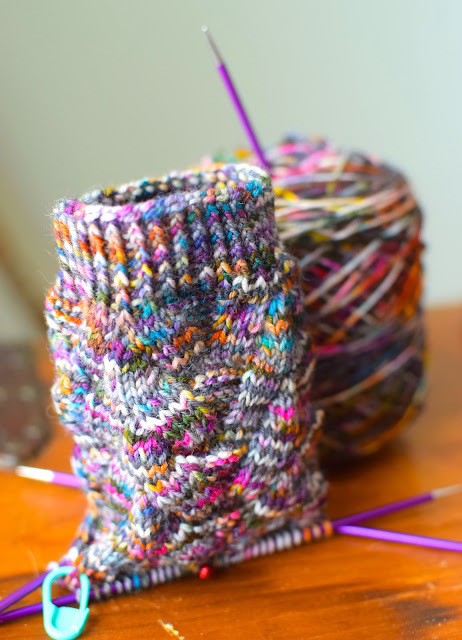 I knit three extra rounds after the last chart repeat and before starting the toe decreases. My shoe size is a women's US 7.5. 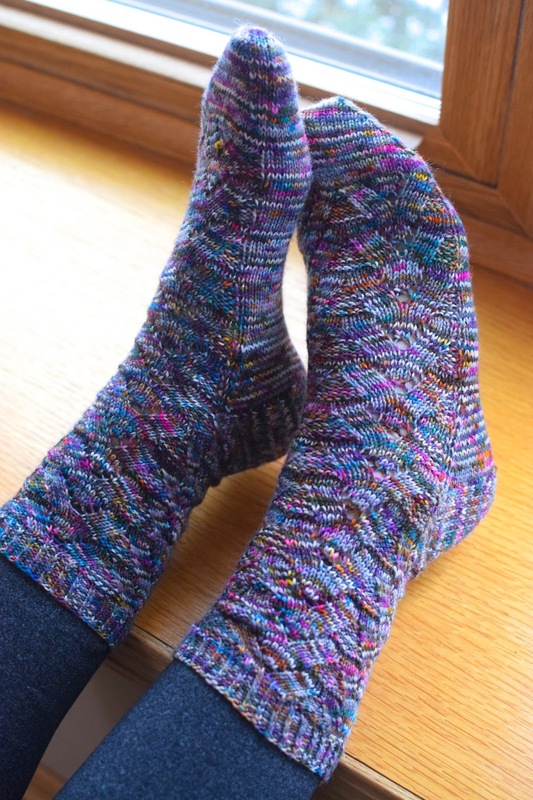 The next longstanding pair I finished is the Regia Arne & Carlos Patchwork Socks! These were so much fun to knit and now they are going to be fun to wear. I combined the leftovers from four different colorways of the Arne & Carlos patterned sock yarn. I have knit full pairs of socks with each of these colors. For the sock I switched the yarn every 10 rounds or so. I worked these socks from the toe-up this time using a variety of techniques. ~ I used Judy's Magic Cast-On to start the toe. 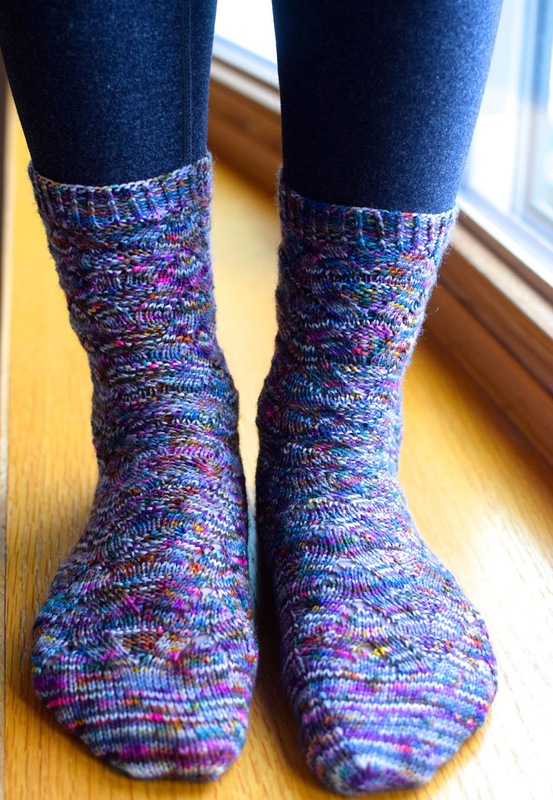 ~ I used a short-row heel variation on page 34 from the book, Sock Architecture by Lara Neel. This short row heel uses increases and decreases only instead of wraps and turns. I like the way it turned out. ~ I used a Russian Bind-off at the top of the cuff for a stretchy bind-off technique. For the toe, heel and cuff I stuck with one color instead of switching it out. Every time I switched yarns in the other sections of the sock I cut the yarn (leaving an end long enough to weave in later) and added in the new color. I like to tie a half-knot around the working strand, sliding the knot up tight to the needle, and then I start knitting with the new color. The tiny knot helps to secure the yarn better in my opinion. I never changed the colors on the front of the leg or foot, or the bottom of the foot. I did all of the color switches on the sides of the socks. Some people don't like to use knots at all but for this project I think it is effective. I stopped periodically, every few inches, while working to weave in the ends. This way I kept up as I was going and it wasn't all left for the end. This makes the weaving in part not so bad at all. I hope you are having a great start to your week! I'll be back soon with more. Thank you to Miss Molly for modeling! 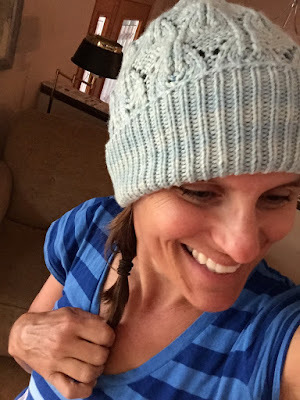 ETA on Feb. 24, 2016: The winner is AnIrishRose on Ravelry! Congratulations. Read to the end to find out what you could win! The rights to the Fairytale Winter Hat have just reverted to me so I can put it up for purchase in my Ravelry Pattern Shop at this time. To celebrate I am offering the pattern at a super low price of $2.50 starting today and ending on Feb. 18th! 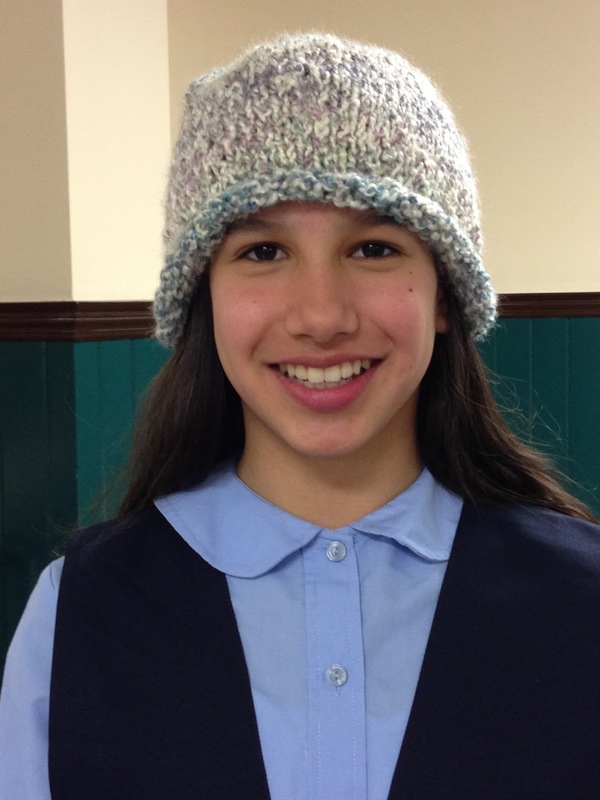 After Feb. 18th the hat will be offered at the regular price of $4.00. No coupon code is necessary, the price is set at $2.50. Click here for the Fairytale Winter Hat information or to purchase on Ravelry! Worsted / 10 ply (9 wpi) ? Rib section: 20-inch circumference to fit an average head size with a 20-23-inch circumference. Grab that skein of worsted weight and dive into this fast and fun hat. The deep ribbed brim is simple and mindless. It could be made shorter if you are using a 100 gram skein. The Fairytale Lace chart (adapted from a chart in Melissa Leapman’s Stitch Dictionary) is simple with yarn overs and simple increases and decreases. The chart includes written instructions. The decrease section of the hat is fully-fashioned to continue in the modified pattern to the end. It's a super fun and fast knit! To fit an average head size with a 20-23-inch circumference. Yarn: Highland Handmades Green Ash Worsted (100% Superwash Merino; 220 yards/125 grams); 1 skein in the Kineo colorway. Finished sample hat in worsted weight weighs in at 109 grams not including a pom-pom. Optional: 2-inch pom-pom maker or a faux fur pom-pom. The white pom-pom is from Bernat and has a 10-inch circumference. SSK slip 2 stitches one at a time as if to knit, then knit the two slipped stitches together through the back loops. YO bring the yarn to the front and over the right needle and to the back. The yarn is just beautiful. It is from Highland Handmades in the Green Ash Worsted in the Kineo colorway. I just fell in love with this yarn and color, it is so light and airy. Green Ash Worsted is 100% Superwash Merino wool. Click here to find out more at the Highland Handmades shop! 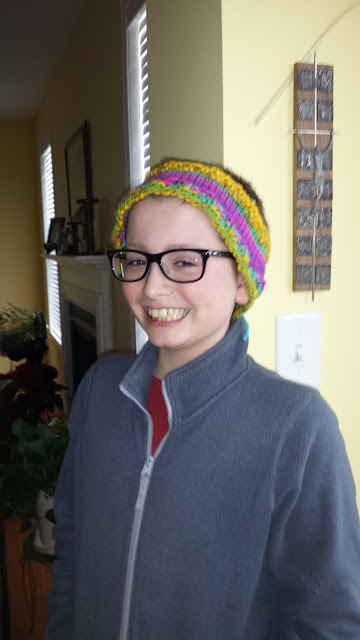 I loved knitting this hat so much! It was pure joy. So I have this extra amazing skein of Highland Handmades Worsted in the Kineo colorway, the same as I used for the hat and a fantastic faux-fur pom-pom (I think the pom is from Lion Brand and it was used in a photo shoot for my last book so I don't have the packaging but it is brand-new!). I am going to randomly select one lucky winner from the list of pattern purchasers. The winner will receive the beautiful skein of worsted weight yarn and the pom-pom as a prize. I will contact you via Ravelry pm if you win. If you purchase the pattern you will automatically be entered to win! Easy-peasy! The pattern is on sale now at the lowered price of $2.50, no coupon code is needed for your convenience. The sale ends Feb. 18th, 2016. I will select the winner on Feb. 19, 2016. 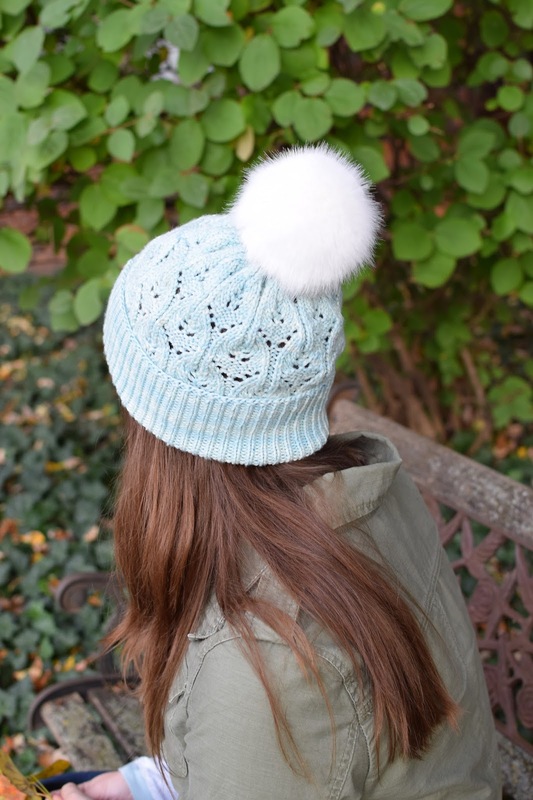 Click here to find out more or to purchase Fairytale Winter Hat on Ravelry! Thank you, as always, for the support if you purchase the pattern (or not!) and I'll be back soon with a winner and much more. First things first, I have a couple of quick announcements. I was a guest on the Yarn Thing podcast this week. You can have a listen to the episode by clicking right here! I have just added a book signing/meet and greet to my schedule at Fancy Tiger Crafts in Denver, Colorado! I will be there on March 1st, 2016, from 7 to 8pm! Click here for more information! I hope you can join me. I have one spot in one class (Egg to Owl) left as of right now for the Yarnover event in Minneapolis in April! Click here to find out more! Meg Swansen is going to be the keynote speaker so I am super excited about that. I love her. Now for the giveaway. I've randomly selected 12 winners to receive 100 grams, enough for a pair of socks, of the Arne & Carlos Regia sock yarn. Thank you to Regia for the fantastic and huge giveaway opportunity. And thank you to all of the people who entered, it was an amazingly huge and fun response! Congratulations to you all! Have fun with your sock yarn. I have contacted all of the winners via Ravelry pm with instructions on how to receive your prize yarn. Now on to a few pairs of fun socks in the works. 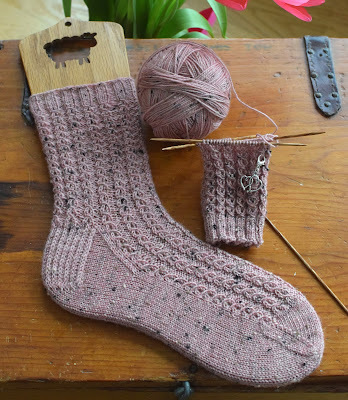 The photo above is a very sweet sock that I started yesterday. I'm really in love with this little sock so far. 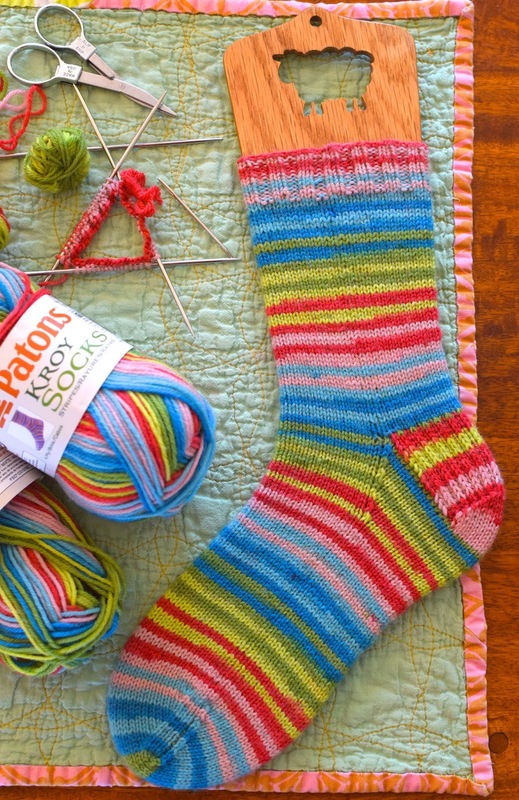 It is the perfect Valentine sock project to have started. Pattern: How I Make My Socks with the added Eyelot Mock Rib Cable from the Ellison Bay shawl by Paula Emons-Fuessle. Stitch Marker from Little Skein. The sweater I am wearing in the photo is Antrorse by Shannon Cook in Quince & Co. Osprey in the Peacoat colorway. I've actually finished the pair in the photo above, in the Patons Kroy Socks yarn but I still need to take a photo of them. I'll post the finished pair photo next time, but in the meantime I did take a video of the finished pair that you can see by clicking right here! For almost daily updates of my knitting you can follow me on Instagram if you'd like. Click here for my Instagram. I love these squishy socks and I got both socks to match perfectly stripe by stripe so that is kind of a treat. It takes effort to get those stripes to match, a lot of winding off and remembering where you started with the first sock. Needles: US size 1.5 or 2.5mm double-pointed needles, 6-inch length, from Knit Picks. I pulled out a sock project that I had started quite awhile ago. I love this sock and can't wait to get the second one finished! The yarn is uniquely dyed so there will not be any pooling or flashing of the colors. I like that a lot. the variety of colors and the quick color changes makes it really fun to knit, too. I'm definitely a bit sock-obsessed right now. I am having the best time with my sock knitting. I am gifting some of my recent sock projects to others in the family, and I need to get some more socks on the needles for both of my sons. They both love their handknit socks and need more in their drawers. Have a great weekend, friends! 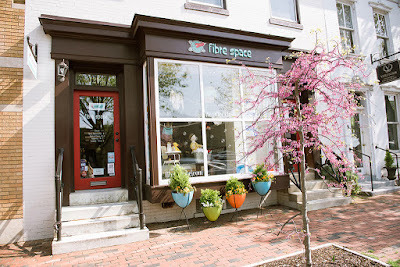 The days are getting a bit longer now and spring is coming right around the corner. There is so much to look forward to and it will all be here before you know it.